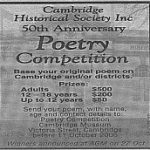 In October of 2006, the Cambridge Historical Society celebrated its 50th Anniversary and a poetry competition was held as part of the celebrations. Entrants’ original poems were to be based on the subject of Cambridge and/or the surrounding districts and we present here the prize winners of each section together with some of the highly commended entries. Mount Maungatautari is a giant piece of Cambridge with the non-flying bird, the kiwi.